After I rode my bicycle across town from the 505 to the Mission and back to the 505 (a twenty minute jaunt each direction because of the lovely snowice), I spent the better part of my day meeting with young people. I had coffee with both Natalie and Elizabeth, which was fantastic on both counts. We talked about things practical and theological, zany and secular. In short, I learned a lot, like I always do when I spend time with teenagers, though Elizabeth no longer qualifies as a teenager. In fact, she is soon going to be an old, married woman. Well, I guess a year from now is hardly soon, but I feel old none the less. When I got home, I had to go run a few errands, which left Bec to make dinner. She concocted a noodle, alfredo, broccoli, mushroom mess. She said it only tasted good with pepper because it was bland otherwise, but I found it to be just fine. (I think by bland she meant not overly salty. She does like her salt.) At any rate it filled me up, but now I think I need some ice cream. I may have to make a trip to the store to fetch some Klondike bars. 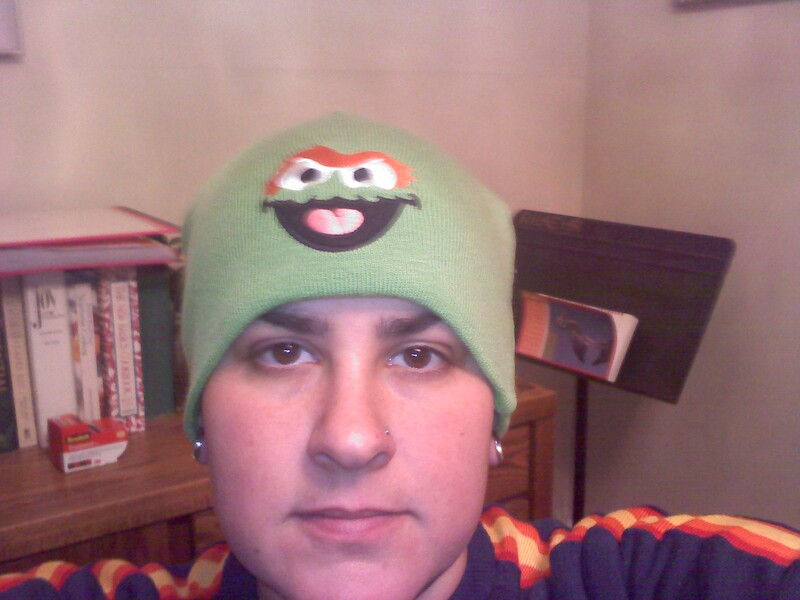 Oh, and I found my Oscar the Grouch hat under the stack of sweatshirts on the floor of the closet. I would say it has been a good day. I am thankful for stacks of books and writing. This entry was posted in Food, Relationships, Religion. Bookmark the permalink.